Nuclear Reactors, BAU, 1st Semester, 2007-2008 (Saed Dababneh). 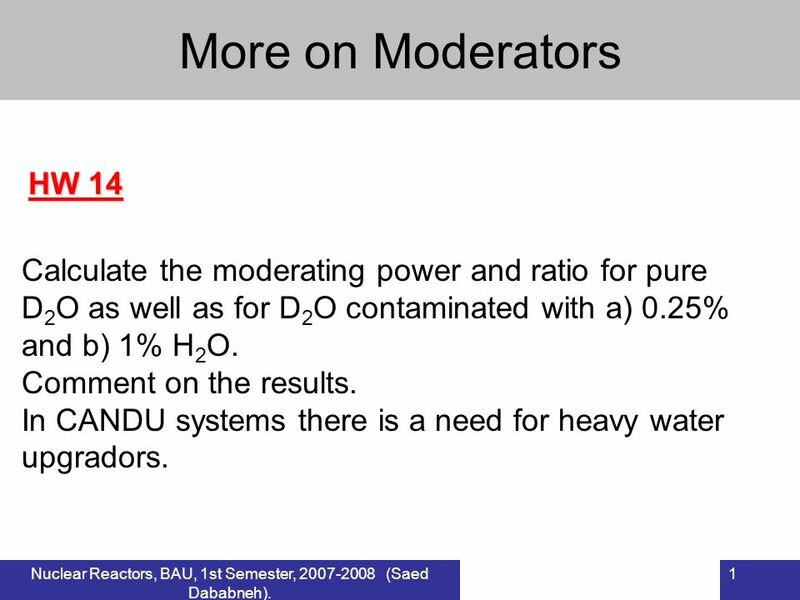 1 HW 14 More on Moderators Calculate the moderating power and ratio for pure D 2 O as well. 1 Nuclear Reactors, BAU, 1st Semester, 2007-2008 (Saed Dababneh). 1 HW 14 More on Moderators Calculate the moderating power and ratio for pure D 2 O as well as for D 2 O contaminated with a) 0.25% and b) 1% H 2 O. Comment on the results. In CANDU systems there is a need for heavy water upgradors. 3 Nuclear Reactors, BAU, 1st Semester, 2007-2008 (Saed Dababneh). 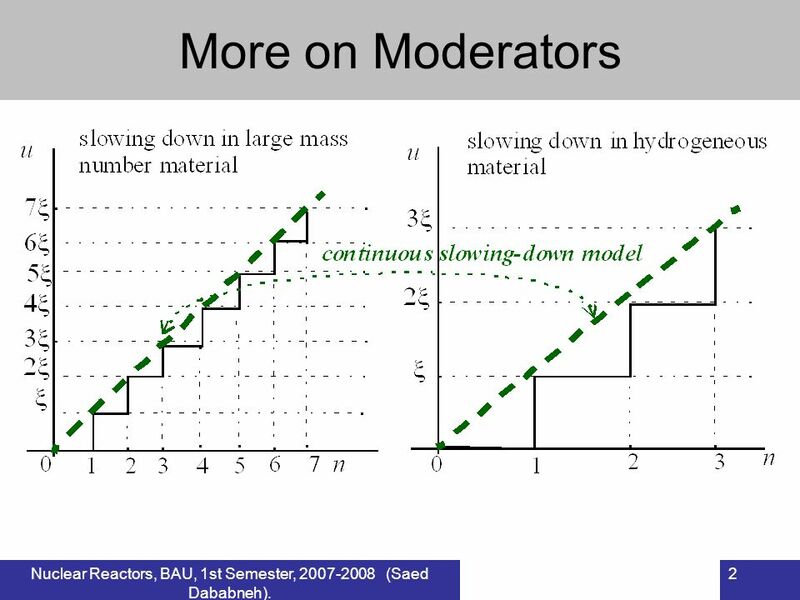 3 More on Moderators Continuous slowing down model or Fermi model. The scattering of neutrons is isotropic in the CM system, thus is independent on neutron energy. also represents the average increase in lethargy per collision, i.e. 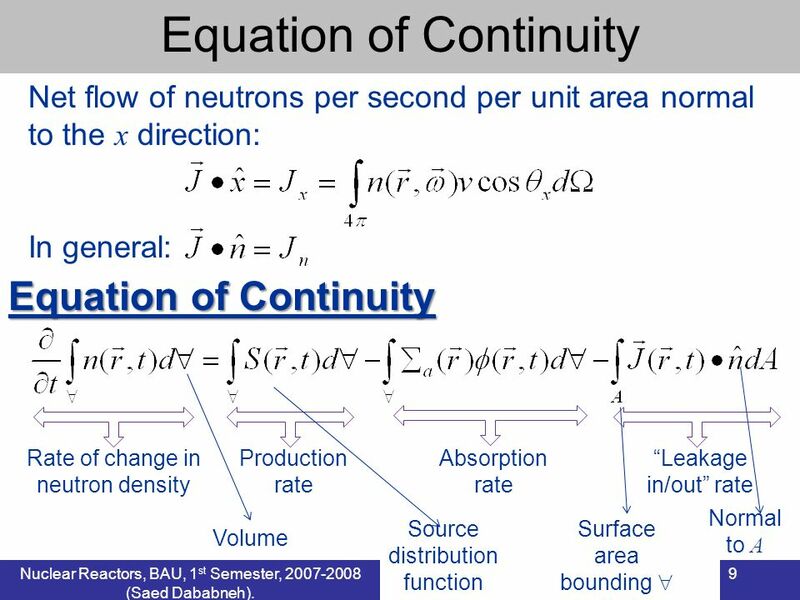 after n collisions the neutron lethargy will be increased by n units. 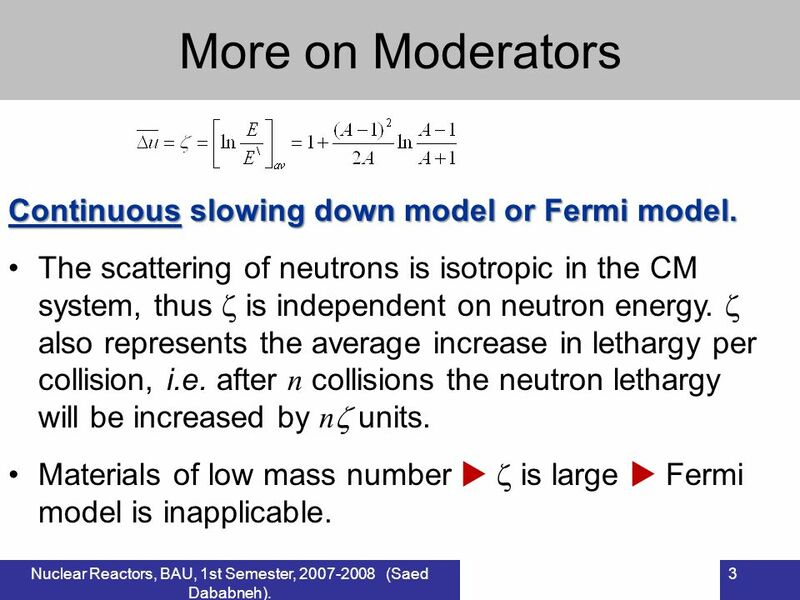 Materials of low mass number is large Fermi model is inapplicable. 4 Nuclear Reactors, BAU, 1st Semester, 2007-2008 (Saed Dababneh). 4 More on Moderators Moderator-to-fuel ratio Moderator-to-fuel ratio N m /N u. 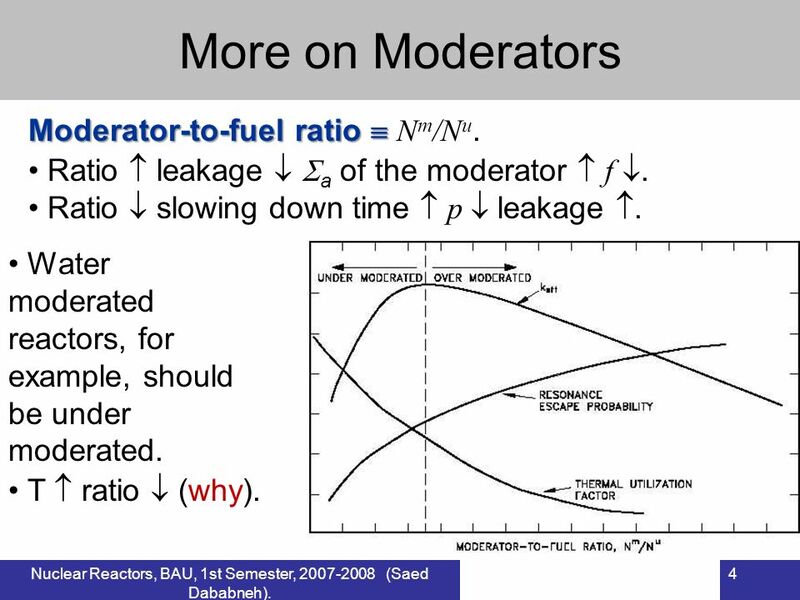 Ratio leakage a of the moderator f. Ratio slowing down time p leakage. Water moderated reactors, for example, should be under moderated. T ratio (why). 8 Nuclear Reactors, BAU, 1 st Semester, 2007-2008 (Saed Dababneh). 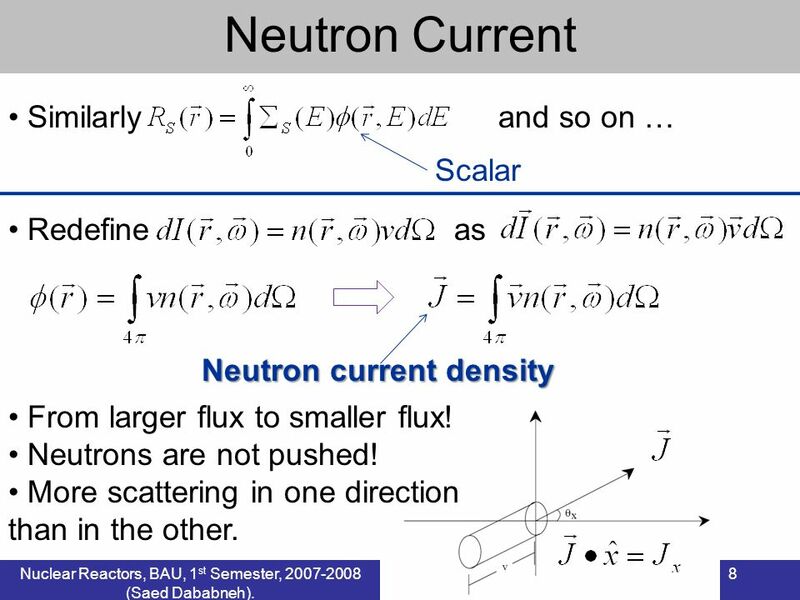 8 Neutron Current Similarly and so on … Redefine as Scalar Neutron current density From larger flux to smaller flux! Neutrons are not pushed! More scattering in one direction than in the other. 12 Nuclear Reactors, BAU, 1 st Semester, 2007-2008 (Saed Dababneh). 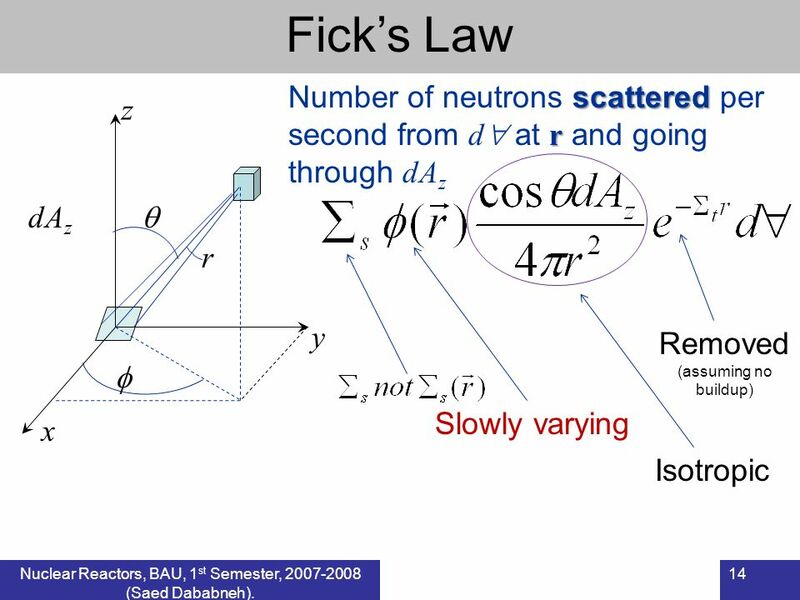 12 Ficks Law Assumptions: 1.The medium is infinite. 2.The medium is uniform 3.There are no neutron sources in the medium. 4.Scattering is isotropic in the lab. coordinate system. 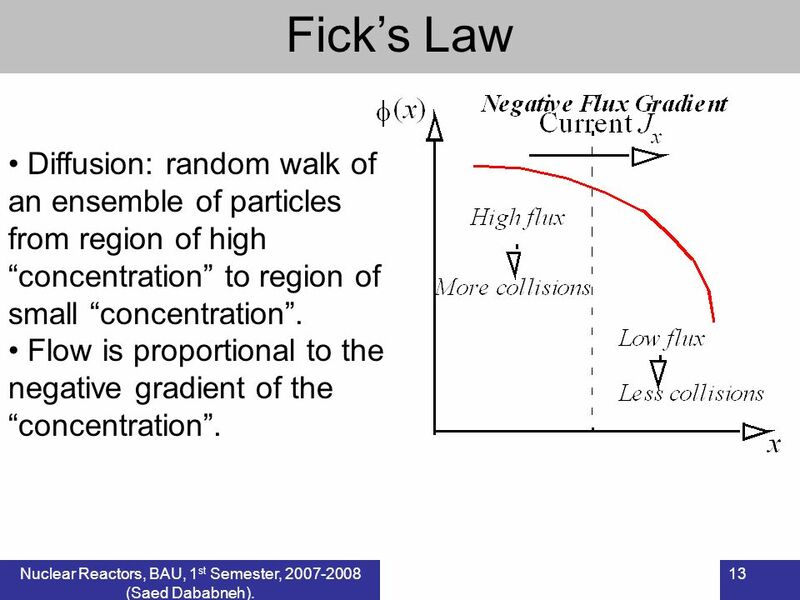 5.The neutron flux is a slowly varying function of position. 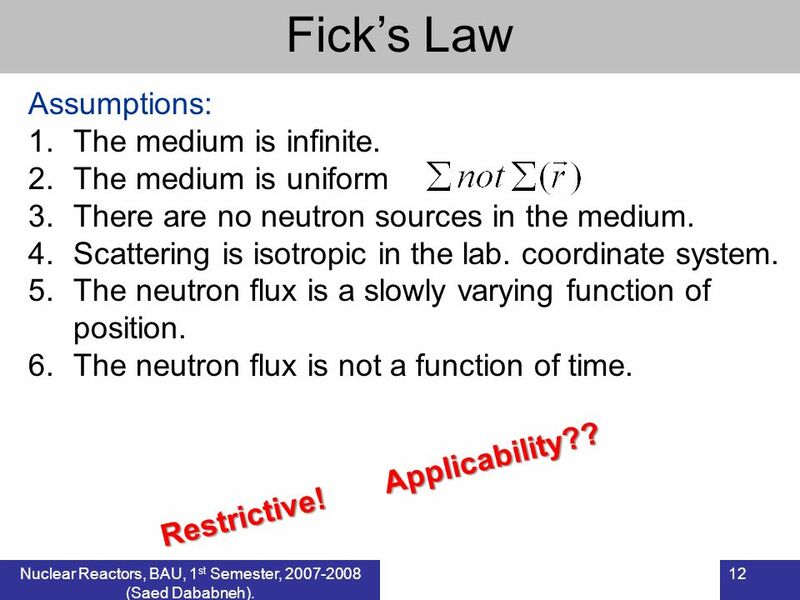 6.The neutron flux is not a function of time. Restrictive! Applicability?? 13 Nuclear Reactors, BAU, 1 st Semester, 2007-2008 (Saed Dababneh). 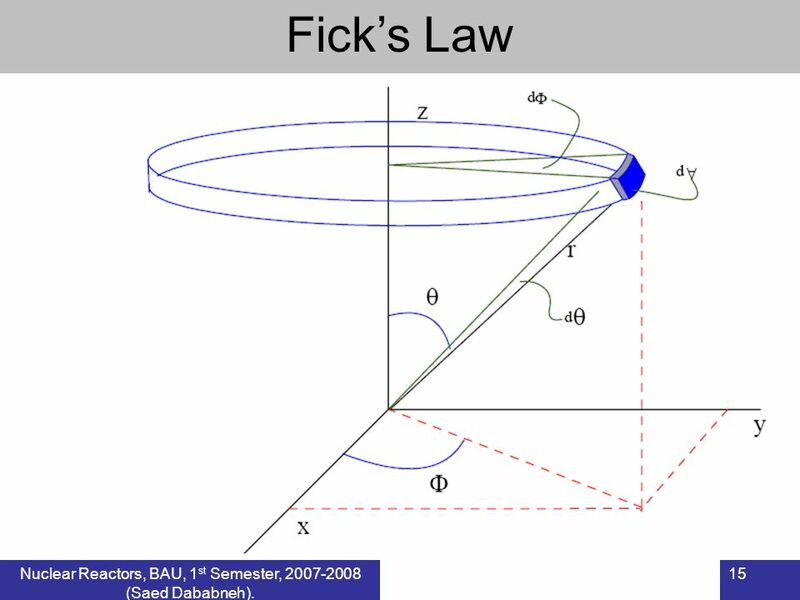 13 Ficks Law Diffusion: random walk of an ensemble of particles from region of high concentration to region of small concentration. Flow is proportional to the negative gradient of the concentration. 16 Nuclear Reactors, BAU, 1st Semester, 2007-2008 (Saed Dababneh). 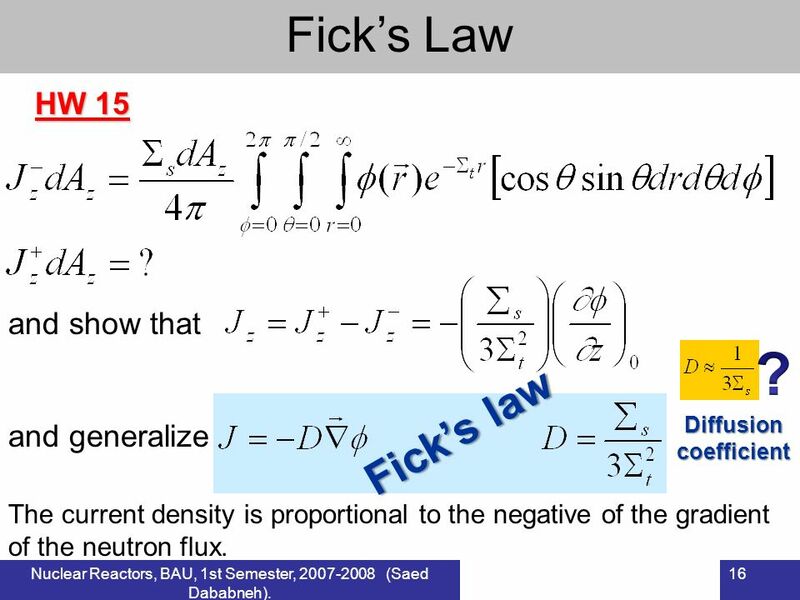 16 Ficks Law HW 15 and show that and generalize Diffusion coefficient Ficks law The current density is proportional to the negative of the gradient of the neutron flux. Download ppt "Nuclear Reactors, BAU, 1st Semester, 2007-2008 (Saed Dababneh). 1 HW 14 More on Moderators Calculate the moderating power and ratio for pure D 2 O as well." 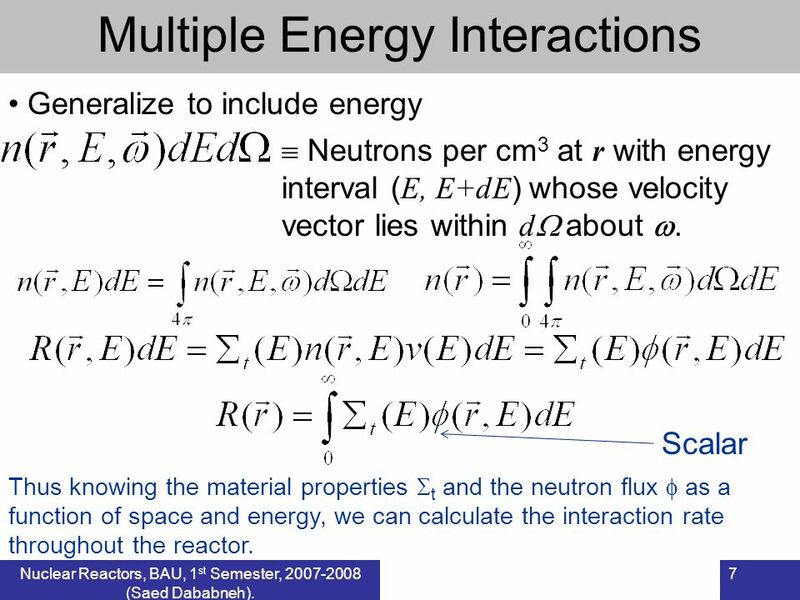 Nuclear Reactor Theory, JU, First Semester, (Saed Dababneh). 1 1/ v 235 U thermal cross sections fission 584 b. scattering 9 b. radiative capture. Nuclear Reactors, BAU, 1st Semester, (Saed Dababneh). 1 Review Test Consider thermal neutrons in natural uranium (19.04 g.cm -3 ), a)What is. 1 Controlled Fission 235 U + n X + Y + (~ 2.4) n Moderation of second generation neutrons Chain reaction. Water, D 2 O or graphite moderator. Ratio of. Nuclear Fission 235U + n  93Rb + 141Cs + 2n Not unique. 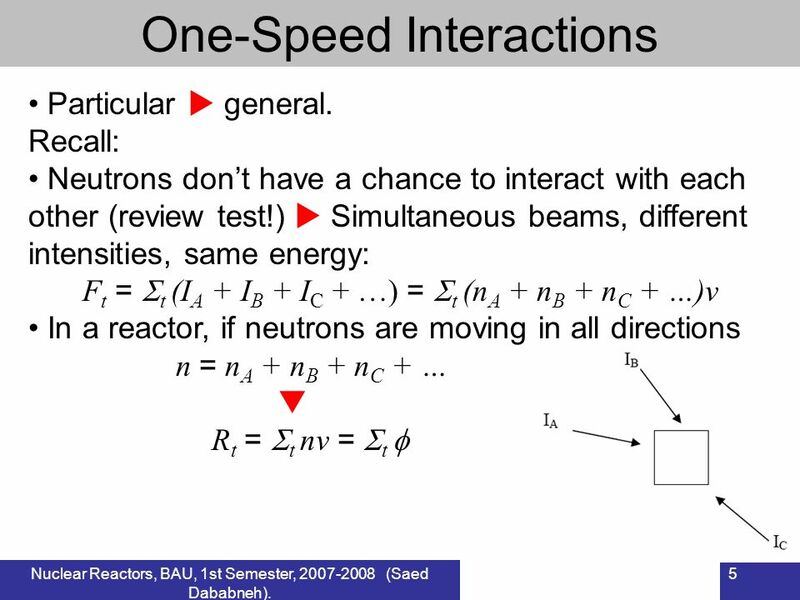 Nuclear Reactor Theory, JU, First Semester, (Saed Dababneh). Nuclear Reactors, BAU, 1st Semester, (Saed Dababneh). 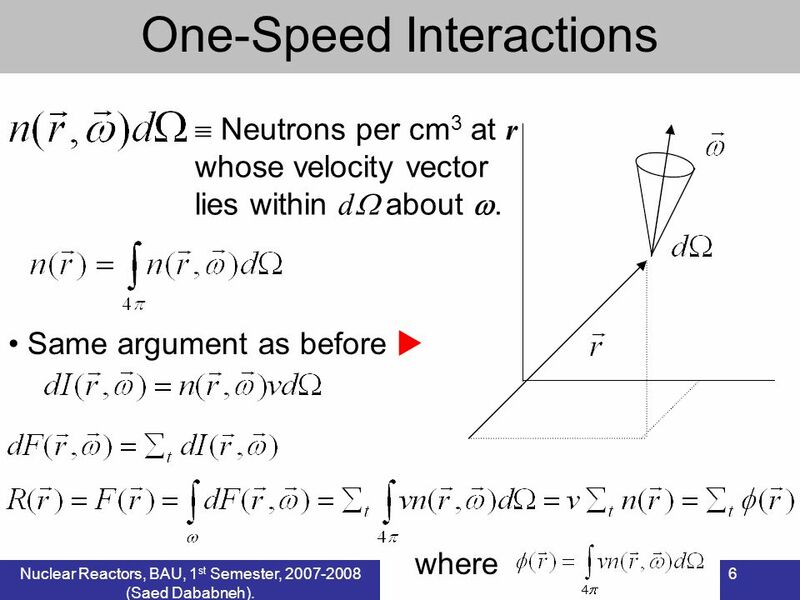 1 Multi-group Model Wide neutron spectrum. One-group, two-group? Should be generalized. 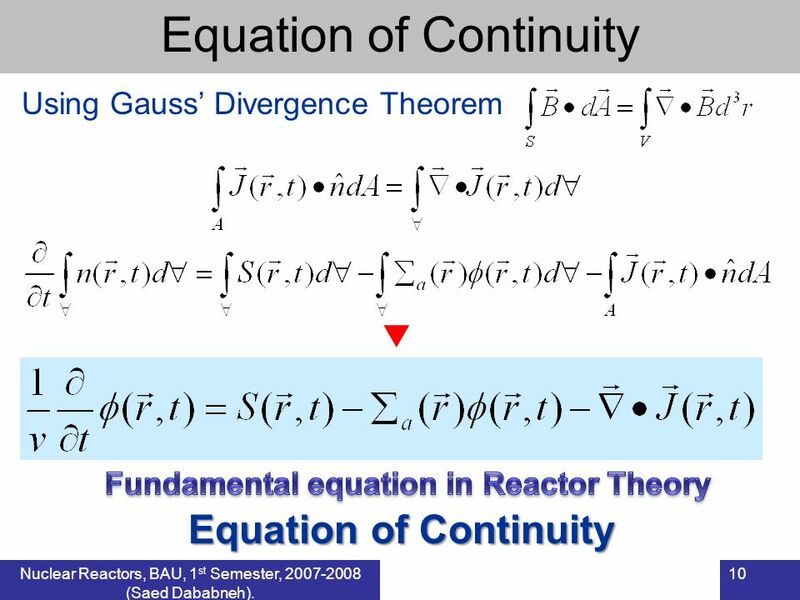 Nuclear Reactor Theory, JU, Second Semester, (Saed Dababneh). 1 1/ v 235 U thermal cross sections fission 584 b. scattering 9 b. radiative capture. Nuclear Size Quite old!!! Not exactly for Au!!! 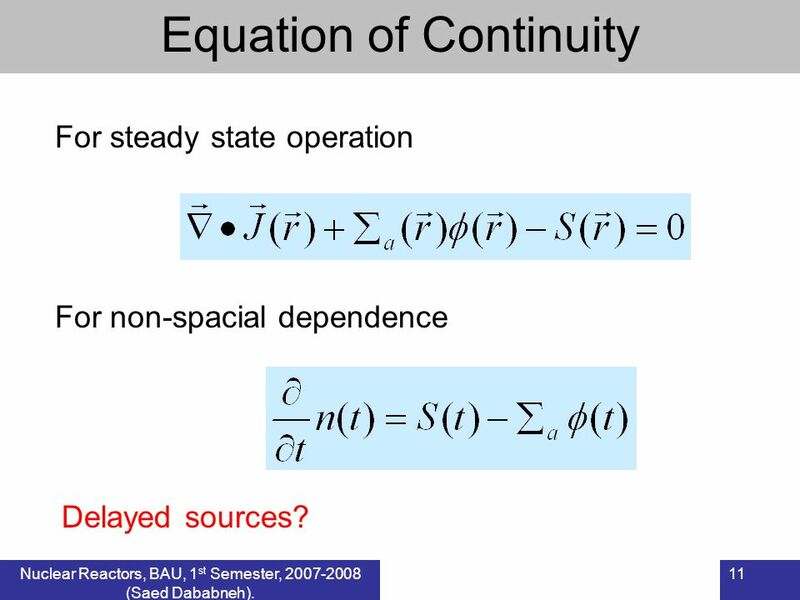 Environmental Engineering Lecture Note Week 10 (Transport Processes) Joonhong Park Yonsei CEE Department 2016. 5. 11 CEE3330 Y2013 WEEK3.